This review is of the cut shown at the Cinecity Brighton Film Festival in November 2018 – the UK release date is currently listed for 22nd March 2019. I have now seen two films by Carol Morley, the first being The Falling with Maisie Williams and a then-unknown Florence Pugh, and now Out of Blue, her very loose adaptation of Martin Amis’s novel Night Train, and from both I have come to the conclusion that Morley is a filmmaker who absolutely does not want to appeal to everyone, even when working with more accessible genres or recognisable actors. I remember being so confused by The Falling after seeing it, and four years later I’m still trying to figure out in my head what some of that abstract imagery was meant to symbolise; with Out of Blue, there are also things about it that are surreal and baffling, but like The Falling they are bound to stay with me for a long while after seeing them. The point is, Morley seems to make movies that she wants to make, and it just so happens that they are rather surreal, almost dream-like escapes into worlds that can be harsh and unforgiving but also visually poetic and unforgettably abstract. Her films are not designed for everyone, and that’s okay with me, especially when Out of Blue is a very intriguing version of a crime drama that only she could bring to life. Set in New Orleans, homicide detective Mike Hoolihan (Patricia Clarkson) is called in to investigate the fatal shooting of noted astrophysicist and black hole expert Jennifer Rockwell (Mamie Gummer), who has been found in an observatory with her face blown off. As Mike digs deep to uncover the truth of her demise, as well as who may be responsible from a wide variety of suspects that include the observatory’s manager Ian (Toby Jones), her boyfriend and colleague Duncan (Jonathan Majors), and her rich war veteran father Col. Tom Rockwell (James Caan), the more she begins to feel an uncomfortable level of personal affection towards the case, especially when it appears to be possible that this murder is linked to another one that hits very close to home for Mike. The movie starts out like a police procedural, as though they took an entire season of a cop show and crammed it into one feature-length film (and at times, with the high level of philosophical monologues and surreal imagery, it feels like a way better second season of True Detective than the actual second season of True Detective), complete with a lead investigative character who’s simultaneously working on her own flaws as well as the case at hand. Soon, though, things take a hard turn into a place considerably different than where we started out, as certain characters begin acting very strangely – to a point where they sometimes don’t seem human – there are revelations about characters that invoke an almost supernatural tone, and even parts of the editing and cinematography start to bring out the truly abstract part of Morley’s filmmaking style. The easiest comparison to make, though that does not make it any less true, is probably Twin Peaks, or indeed anything that David Lynch has put his fingerprints on; outside of them both being crime stories about a murder of a young woman – not to mention how Patricia Clarkson actually does look and dress a little like Kyle MacLachlan in this film – both Twin Peaks and Out of Blue are surreal descents into otherworldly territory, sometimes nightmarish but always odd and feeling most definitely not of this world. With her film, however, Morley has decided not to place all the attention on the surreal environments, but instead opt for a slightly more grounded focus, that being the growing turmoil of its lead character as she becomes more and more emotionally withdrawn from the world whilst learning the truth about this case. Clarkson, a New Orleans native herself, takes a firm grasp of the pulpy material that Morley has unapologetically made her own – from what I understand about the original novel by Martin Amis, this adaptation is radically different, with barely even the same dialogue making its way over, in a similar way to how Stanley Kubrick’s The Shining was considerably removed from Stephen King’s book – and finds a wavering, downtrodden soul in her character to make not necessarily likeable but a very human presence in an otherwise surreal world. She ends up giving an impressively grounded performance as a result, which helps to guide the audience through this very strange journey even when Morley’s unique style threatens to alienate them. Though the movie isn’t entirely rid of certain cop movie clichés, such as the red herring, the hard-boiled interrogations, and a final revelation that somehow ties all the clues together in a way that doesn’t ring entirely plausible, the cop element of the story turns out to not be the point. What Morley has undoubtedly tried to do with this film is offer a surreal, almost Lynchian, alternative to the crime drama that, like her previous work, is most definitely not designed for everyone, but that hasn’t stopped her from going out and making exactly the kind of film she wanted to make, and she should be commended for not bowing to audience expectations and keeping her artistic integrity intact. 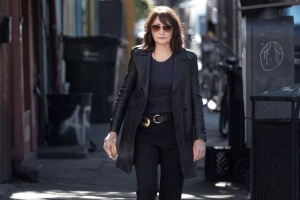 Out of Blue is a surreal crime drama that will most certainly not appeal to everyone, but director Carol Morley’s unique and almost Lynchian style, as well as a very impressive lead performance by Patricia Clarkson, will be enough for specific audiences.